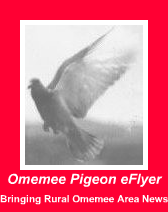 Omemee Pigeon eFlyer: Omemee History Books Sought - Letter to the Editor Jan 04 /15! Omemee History Books Sought - Letter to the Editor Jan 04 /15! Do You Have Spare Omemee History Books? A former Omemee resident is searching for two Omemee History Books. Can you help? Two Omemee History Books Sought - Can You Help? Do you have a spare copy of one or both of these books?